Samuel Dennis Warren (1852 – February 18, 1910), also Samuel Dennis Warren II, was a Boston attorney. Warren was born in 1852. His father was also named Samuel Dennis Warren, known as S.D. Warren, who founded the Cumberland Paper Mills in Maine. 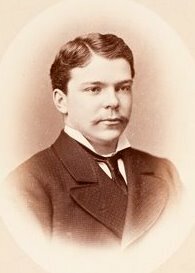 He had four siblings: Cornelia Lyman Warren, philanthropist; Henry Clarke Warren (1854-1899), scholar of Sanskrit and Pali; Edward Perry Warren (1860-1928), art collector; Fredrick Fiske Warren (1862-1938), political radical and utopist. He graduated from Harvard College in 1875 and graduated second in his class at Harvard Law School in 1877. The first-place student was his friend Louis Brandeis, later a justice of the United States Supreme Court. Warren was editor of the Harvard Crimson. Warren and Brandeis founded the prominent Boston law firm of Nutter McClennen & Fish in 1879. At the end of 1890 they published their famous law review article "The Right to Privacy" in the Harvard Law Review. It is "one of the most influential essays in the history of American law" and is widely regarded as the first publication in the United States to advocate a right to privacy, articulating that right primarily as a "right to be let alone". Brandeis later acknowledged that the idea for the essay originated with Warren's "deep-seated abhorrance of the invasions of social privacy" on the part of the press. In 1899, he left law to oversee the family's paper production business. He managed the family trust established in May 1889 with the legal assistance of Brandeis to benefit his father's widow and 5 children. In 1906, Warren's brothers Edward and Fiske charged that Brandeis had structured the trust to benefit Samuel at the expense of his siblings. The dispute ended with Samuel's suicide in 1910. The Warren Trust case became a point of contention during the 1916 Senate hearings on the confirmation of Brandeis to the Supreme Court and it remains important for its explication of legal ethics and professional responsibility. Warren served from 1902 to 1906 as president of the trustees of the Museum of Fine Arts, Boston. in 1883, he married Mabel Bayard, daughter of Thomas F. Bayard, U.S. Senator from Delaware from 1869 to 1885. They had six children. He committed suicide in Dedham, Massachusetts, on February 18, 1910. His family disguised his suicide and the date of his death. The New York Times reported that he died of apoplexy on February 20. ^ Green, Martin Burgess (1989). The Mount Vernon Street Warrens : a Boston story, 1860-1910. Charles Scribner's Sons. Retrieved 4 January 2018. This article incorporates text from this source, which is in the public domain. ^ a b c "Samuel D. Warren Dead". New York Times'. February 21, 1910. Retrieved October 28, 2011. ^ "Former Crimson Editors". Harvard Crimson. May 1, 1908. Retrieved March 24, 2017. ^ Gallagher, Susan E. "Introduction". "The Right to Privacy" by Louis D. Brandeis and Samuel Warren: A Digital Critical Edition. University of Massachusetts Press. ^ See, e.g., Dorothy J. Glancy, "The Invention of the Right to Privacy" Archived 2010-07-22 at the Wayback Machine, Arizona Law Review, v.21, n.1, pp.1-39 (1979), p.1 ("The right to privacy is, as a legal concept, a fairly recent invention. It dates back to a law review article published in December of 1890 by two young Boston lawyers, Samuel Warren and Louis Brandeis."). ^ 4 Harvard L.R. 193 (Dec. 15, 1890), paragraph 1. ^ Amy Gajda, What If Samuel D. Warren Hadn’t Married A Senator’s Daughter? : Uncovering The Press Coverage That Led To "The Right to Privacy", November 1, 2007, p. 7, passim. His antipathy toward the press, she argues, derived from press coverage of his wife's family. ^ Lane, Frederick S. (2009). American Privacy: The 400-year History of Our Most Contested Right. Beacon Press. Retrieved March 26, 2017. ^ Kennedy, Mopsy Strange (June 3, 1990). "Brawling Brahmins". New Tork Times. Retrieved March 26, 2017. ^ "Sum Up the Case Against Brandeis" (PDF). New York Times. March 29, 1916. Retrieved March 23, 2017. ^ Green, Martin (1989). The Mount Vernon Street Warrens: A Boston Story, 1860-1910. New York: Scribner's. pp. 167, 170. ^ Green. The Mount Vernon Street Warrens. pp. 3ff. This page was last edited on 2 October 2018, at 20:44 (UTC).